The Almighty Pineapple has transformed me personally in my life. You see the Pineapple is a running joke with my longstanding clients. I always tell my clients to Pray/Meditate a.k.a. the 1-2 combo (like a punching combination in boxing). I don't particularly care in who you believe in and I don't judge anyone. If you choose to honor Energy, Jesus, Spirit, Source, Allah, Buddha, a chocolate dragon or the Almighty Pineapple it is all good with me. If the Almighty Pineapple brings you to a higher level of Ascension and restores your faith in yourself, then ALL HAIL THE ALMIGHTY PINEAPPLE. It made all my clients laugh during the first 10 minutes of a reading. Laughter heals and its important for me that my clients are comfortable with me. That's how I got the logo with the Pineapple and after doing much research I saw how it resonated with me completely. Pineapples are associated with wealth, good fortune and good luck. Dried pineapple makes for excellent sachets and incenses that can draw wealth to the home and encourage financial gain, or fresh pineapple can be baked into cakes and desserts to gift to friend and bless them with good fortune as well. Pineapple is ruled by fire and the sun, and carries the energies of strength and power. It can be incorporated into charms for vigor and courage. It's a benefit to spiritual power, and can increase personal magical energy as well as strengthen psychic experience and intuition. So you see how perfect it fits!! Makes sense I’m a triple fire sign. Ha ha I think! Anyways back to who I am. 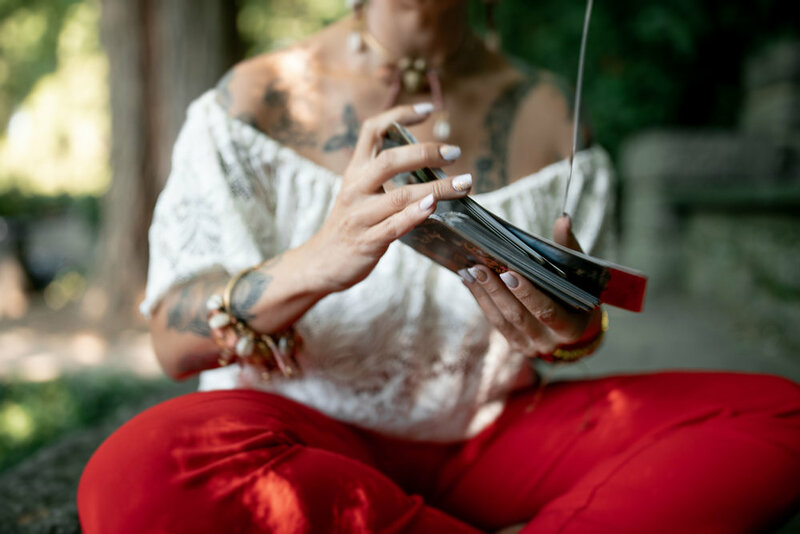 I am Vida, I am an Espiritista aka Psychic Medium, Seer, Consejera (reader since 1988) into Past Lives , Akashic Records, Channeled messages, Mentor/Teacher, Shaman (since 1997) , initiated through an actual Death & Resurrection aka Curandera, Ancestral Rituals & Hoodoo Practioner aka Rootworker (see paragraph below) & Pranic Healer. Things I don't like labeling in any way shape or form; but in this society it's ridiculous how a title changes perception. I rather go by INTUITION & experience. I am a hyper sensitive energetic intuitive, also I am clairvoyant, clairsentient, claircognizant, clairaudient, clairtangent, clairsalient and clairgustant. I am also called a Physical Empath or highly sensitive person with personality type INFJ. I began seeing Spirit and speaking to the dead since I was 3 years old. When I was a child I had visions, I heard voices, I talked to Source, I saw Angels, I visited other worlds, I spoke to spirits. I thought everyone saw the same. I was told I had a wild imagination, only by those who could not see. I was lucky enough to have an amazing mother who accepted my ability and grandparents who encouraged me even though I was taught very young not to discuss my "abilities" to others in the family. I was able to let my grandmother know who was calling her on the phone before she answered (no caller ID back in the day) and little did I know my grandmother and I were a lot alike. She was a psychic medium, hoodoo practitioner and rootworker as well in Cuba and did readings and held seances (misa’s) in her home. When she came to the United States she stopped practicing out of fear but always held her altars high for her Orishas and Saints. So no you can't learn to be a medium. I didn't ask for this, it chose me and I am so glad it did. It has not been easy at times, during my times of ascension and transitioning into the 5th & 6th dimensions (while living in 3rd dimension-UGH) but I have an amazing unseen squad. My divine team my guardian angels who have been with me during every lifetime (yes I have been here numerous times-prehistoric soul), my spirit guides, my ancestors from this lifetime and prior lifetimes, archangels, ascended masters, orishas, elemental beings, power animals and of course the one and only Source! I am a root worker and practice Hoodoo ( it is not the same as voodoo) so please don't assume the worst. I cast spells and Hoodoo is to change certain elements in your life but at the end of the day it is all about Free Will! Everyone on this earth has that right. *Custom orders🕯🌬🌊🍃 (spell work) upon request and more detailed situations. Binding, hex breaking, love, money etc..These can be done for a certain number of days or by force of power; for example once, twice or thrice the spell. The more times I do the spell work obviously the more potent. 👁Available for group readings, hoodoo/rootwork, parties, events and conventions upon request. Respect my boundaries and conditions. I may be a spiritual advisor but I am having a human experience just like you. I am flawed in the human realm, just like you. I am no better than anyone, just like you. I just surrendered to my life purpose, soul contract and made it my mission to change the Human Race, Animal Race & Environmental Race; one heart at a time and one day at a time. I am off on Sundays I honor Sabbath and on Saturdays I have pre-booked events in advance through 2020. PURCHASE AT YOUR OWN DISCRETION ALL SALES ARE FULL AND FINAL, NO REFUNDS OR EXCHANGES.